One of the many benefits of being a member of the Arizona Technology Council is having an advocate for driving a pro-growth, business-focused state and federal technology agenda. Through the efforts of the AZTC Public Policy Committee, the Council informs and educates policymakers on issues that are important to the future of Arizona’s technology community and testifies before the state legislature on a regular basis. The results are rewarding. Among the many achievements, the Council’s public policy advocacy efforts have created one of the friendliest environments in the country for research and development, right here in Arizona. To help you keep a better pulse on our public policy positions, we’ve created the fourth annual Public Policy Guide. 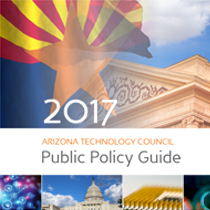 The 2017 Guide provides a detailed outline of the Council’s advocacy activities, featuring principles and positions to aid elected officials at all levels of government as they craft policies that will affect the technology industry and Arizona’s economy for years to come. When reviewing the document, you’ll find that our positions and initiatives are crafted to create outcomes like a healthy business climate for technology-related job creation, adequate sources of capital that encourage entrepreneurship and highly trained talent to compete in a global, innovation-based economy. Click here to see our 2017 Public Policy Guide.